Heavy duty metal detector for cardboard cartons inspection. This model is suitable for inspection of flat cardboard boxes blanks and light pannel on the production line. The large, easily legible display makes operability easy. Simply by feeding a product through the detection unit several times makes it possible to store the product characteristics in memory and automatically set to the optimum sensitivity, thereby eliminating the need for bothersome adjustment procedures. The characteristics of a product (product effect) change due to changes in product temperature and so forth. This function tracks these changes and automatically keeps the most adequate setting at all times. The characteristics of up to 200 products can be stored in memory in accommodation of production lines handling a wide range of products. Kind of products is displayed using product names. Conveyor belt can be easily detached and attached for cleaning. And the structure makes retention of product dust minimum, while waterproof (IP65-compatible) types can be washed with water. This function allows the detector to transmit data to related equipment using an RS422 or RS232C interface (optional). Can save the history data and settings to a USB memory, it can also be output to a dedicated printer. Operation history can be confirmed in indicator. The last 999 operations including power on/off, setting change, metal detection, etc. are stored in memory with each time. 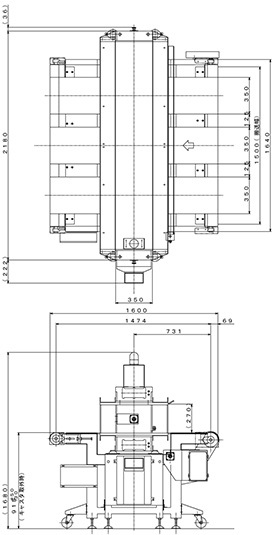 In addition to the above, customized specification meets with your requirement is also available. *1: These data show results of measurements at factory. Please note that actual metal detecting sensitivity depends on the product characteristics and operation environment. 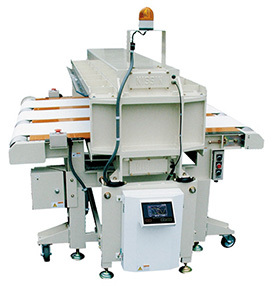 Conveyor mounted metal detector for cardboard cartons inspection.